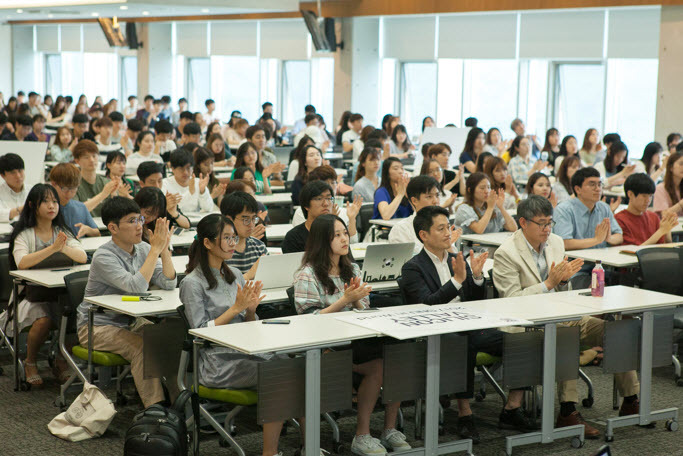 On June 21, the Office of International Affairs inaugurated this year’s SNU in World program, which provides students the opportunity to study abroad during the winter and summer breaks. The SNU in World program began in 2012. This past summer, students went to Beijing, Tokyo, Berlin, Madrid, France, London, Moscow, and Silicon Valley. At the ceremony SNU President Sung Nak-In expressed that he hopes the SNU in World program to “‘upgrade’ our global leaders through this valuable opportunity to go abroad and experience what the world holds for them.” The Silicon Valley program, focusing on the fourth industrial revolution, was a new addition to SNU in World. The curriculum was designed to nurture aspiring entrepreneurs by combining engineering and business components. The program was hosted by Stanford University, where students were able to interact with successful IT leaders in California. In addition to the new program at Silicon Valley, a new SNU in China initiative plans to hold its program at the Xinan Theological Seminary in Qingnan, Lianing Province, after Chinese President Xi Jinping made a visit to SNU back in 2014.